Hagiography, or writing about and illustrating the lives of saints, was one of the most creative areas for artistic inspiration in the literature and arts of the Middle Ages. This book explores the sumptuously illustrated saints' lives that were made in medieval Europe. Cynthia Hahn discusses a broad range of manuscripts and other artifacts, many of which are reproduced here, and provides an analysis of their pictorial and narrative structure. Hahn's book is a virtual compendium of images-many rarely published-as well as a learned study that deepens our understanding of the role of various types of saints, the nature of their audience, and the historical moment when individual works were produced. After two informative introductory chapters setting the historical and narrative context of pictorial hagiography, Hahn considers the Lives of Martyrs and Virgins, Bishops, Monks and Abbots, and Kings and Queens, and concludes with an examination of the extraordinary chronicles and illustrations of the lives of saints by the English monk Matthew Paris. She considers such questions as: Why were illustrated saints' lives produced in such great numbers during this period? Why were they illustrated at all given the trouble and expense of such illustration? 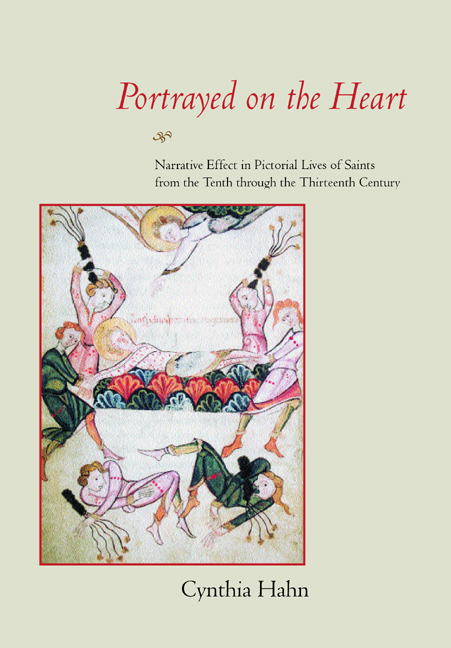 And to whom did the saints' lives appeal, and how did their readers use them? As she addresses these and other intriguing questions, Hahn traces changes that occurred over time both in the images and the stories, and shows how their creators, mostly the intellectual elite, were finely attuned to audience reception. This important aspect of hagiographic production has received scant attention in the past, and as she considers this issue in light of contemporary narrative theory, Hahn brings us to a fresh appreciation of these intricately illustrated manuscripts and their multiple audiences. Cynthia Hahn is Gulnar K. Bosch Professor of Art History at Florida State University and author of the facsimile edition of the Passio Kyliani, Psuedo Theotimus, Passio Margaretae . . . Hannover Niedersächsische Landesbibliothek, Ms. I.189 (1988).